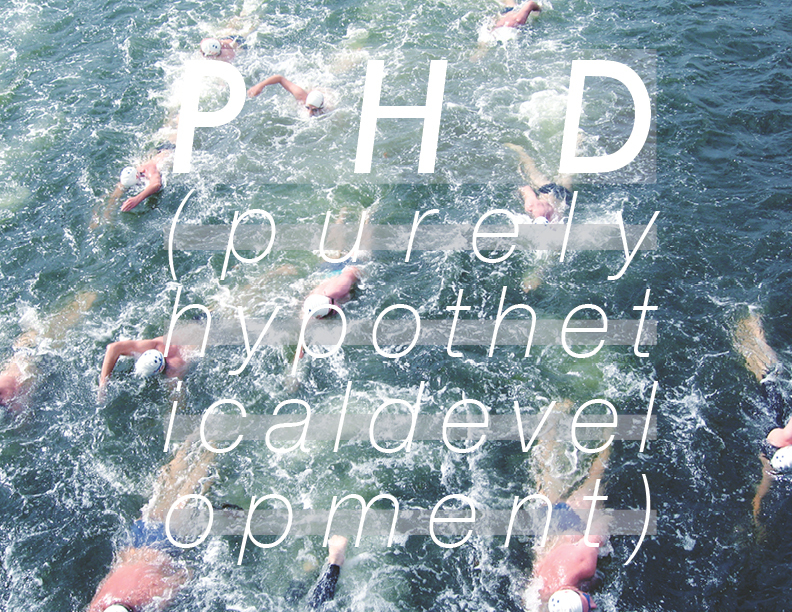 While we are busy ironing out the details of our final project at CIVIC Space (more details on this soon), we are pleased to announce a smaller interstitial project called PHD, standing for Purely Hypothetical Development. The idea for PHD came out of a conversation we had over a coffee one afternoon around art and education, and whether one necessarily needs the other or not. Is a post-secondary institution the appropriate place to develop an art practice, or is it really just all hypothetical, or worse yet, is it even hypothetical enough? So, in the spirit of experimentation and inquiry, we are launching PHD, a two week program where we invite four participants (the boundaries are intentionally vague here) to work at CIVIC Space during the first two weeks of March. Together these people will explore ideas, trajectories of thought, impossibilities, margins, peculiarities, relationships, and they will share their findings with the others working in the space. The developments will be hypothetical; there might not be outcomes, but this brief burst of concentrated thinking is bound to produce something unexpected. Participants at the end of this program will present their ideas and earn their “PHD”. Applications are open. Those interested in participating in PHD can email Sara Howie at sara[at]brokencitylab[dot]org or click on the link above. Please include your name, a brief description of a project you would like to hypothetically develop, and a little bit about your interests. Applications close February 28th and those chosen will be informed shortly afterwords. 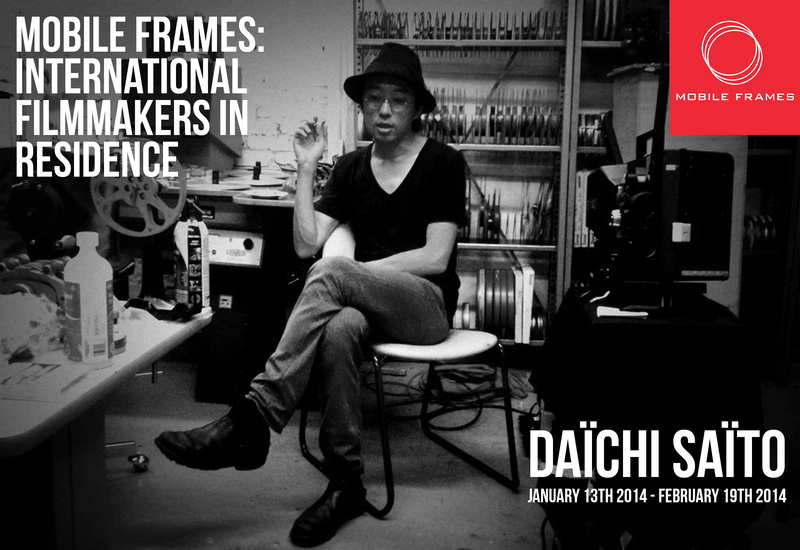 Mobile Frames is pleased to announce our first series of FREE 16mm workshops, conducted by Montréal-based filmmaker in residence Daïchi Saïto, February 13th, 15th and 16th. The workshops are completely FREE and open to Windsor / Detroit residents. Spaces are limited! Registration is required. Combining lecture and hands on practice, this workshop surveys the fundamentals of do-it-yourself filmmaking. Aspects of cinematography including light, camera, lens and film stocks, as well as the properties of film and processing chemicals, are covered. Participants will learn to shoot in 16mm with a Bolex Camera, make homemade film processing solutions out of raw chemical ingredients and hand process their own footage using various techniques. This workshop will prepare participants for further explorations of celluloid filmmaking and experimentation with film processing. All materials are provided. No previous experience with 16mm filmmaking is required. Daïchi Saïto is a co-founder of Double Negative, an artist’s collective in Montreal dedicated to exhibition and production of experimental cinema. His films have screened at festivals, museums and cinematheques worldwide and are in the permanent collections of the Austrian Film Museum and the Slovenian Cinematheque, and are distributed by Light Cone (Paris), Arsenal (Berlin) and the CFMDC (Toronto). Saïto has taught cinema at NSCAD University in Halifax, Concordia University in Montreal and the Escuela Internacional De Cine in Cuba. The series is presented by Media City Film Festival, together with Broken City Lab, Common Ground Art Gallery and Momentum Film & Video Collective and is made possible through the generous support of the Ontario Trillium Foundation. Media City Film Festival acknowledges the support of the Ontario Arts Council and the Canada Council for the Arts. A zine is a small edition of self-made, self-published bodies of work made up of text, photos, or found content. Since 2010, Rosina Riccardo has been creating and assembling zines of her own, and most recently hosts Zine Workshop Nights at CIVIC Space on a bi-weekly basis (the next date being Wednesday, December 18th at 7pm). For a new and upcoming two-day (weekend) residency, Rosina will create content from scratch, which will reflect her time spent observing and interacting with the downtown core. Upon completion, a limited run of the zines will be made available to the public at Civic Space. Stay tuned for more info! Just last month our friend Rodrigo Marti put together a project here at CIVIC Space, the substantially titled, “THANKSGIVING * DIA DE ACCION DE GRACIA * FOR THE LOVE OF GOD * POR EL AMOR DE DIOS * CLOTHING SWAP * MERCADO TRUEQUE DE ROPA“. Near the end of Rodrigo’s stay in Windsor, he sat down with Dennis Hunkler of ArtWindsor, which is a fairly new web-only Windsor arts resource put together by Arturo Herrera. It features, among other things, interviews with Windsor artists, most of whom are just starting their careers in the arts and are speculating as to what will happen. It’s an interesting twist on conventional artist interviews and in the best cases, helps to capture a time of unlimited possibility. After chatting with Dennis earlier in the setup of his show, Rodrigo sat down again and discussed the issues surrounding the kind of work he does, the misconceptions that often arise, and how he intended the work to function. To learn more about Rodrigo’s work, please visit here. Join us November 23rd, between noon to 5pm, to talk taxes! We’re thrilled to announce that our good friends Chris & Simon of Department of Unusual Certainties (they have worked with us here and here and will be part of Neighbourhood Spaces 2014) are back in Windsor putting together Opt0ut Man, the first stage of a project exploring issues around taxation. Opt0ut Man is everyone – the belief that we give, but do not receive. Our society has been built on the ideal that we are all in this together. Increasingly we stand witness to changing ideas of what building a society means – a strong individual, means a strong country. The old adage that there are only two certain things in life, taxes and death, begs the question of what life do we want? 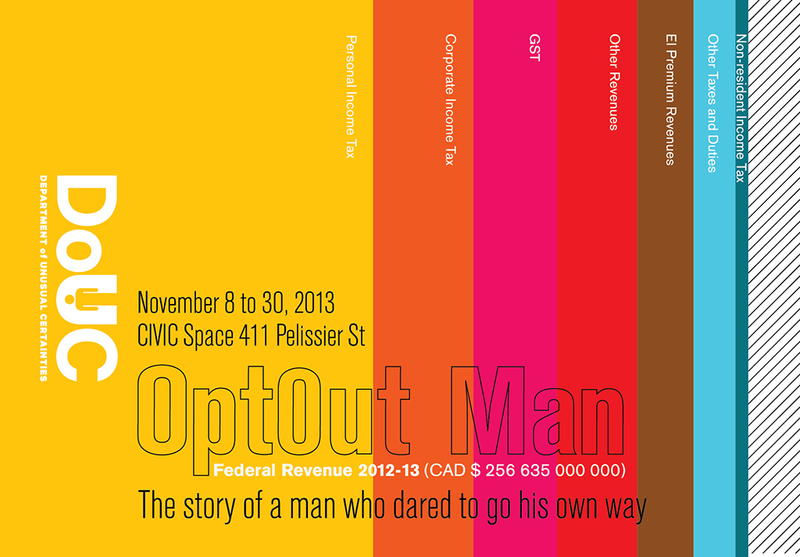 Opt0ut Man is an exploration of thoughts, opinions, opportunities, facts and consequences responding to the premise “What would happen if an individual had the option of opting out of the tax system?” expressed as a story. Seen for the first time in CIVIC Space, it is the first stage of longer term project. Founded in 2010, Department of Unusual Certainties integrates the partial perspectives gleaned from its members committed explorations of a range of disciplines towards the creation of a truly Public Art. Over the last 24 months, DoUC has published work in magazines in North American and European. They have also exhibited projects across Canada, as well as at the 2012 Venice Biennale of Architecture and at the Prado Media Lab. They were strategic partner to Migrating Landscapes Organizers, curators of the Canadian Pavilion 2012 Venice Biennale of Architecture; and were the 2011 Innovators in Residence at the Design Exchange, Canada’s design museum. 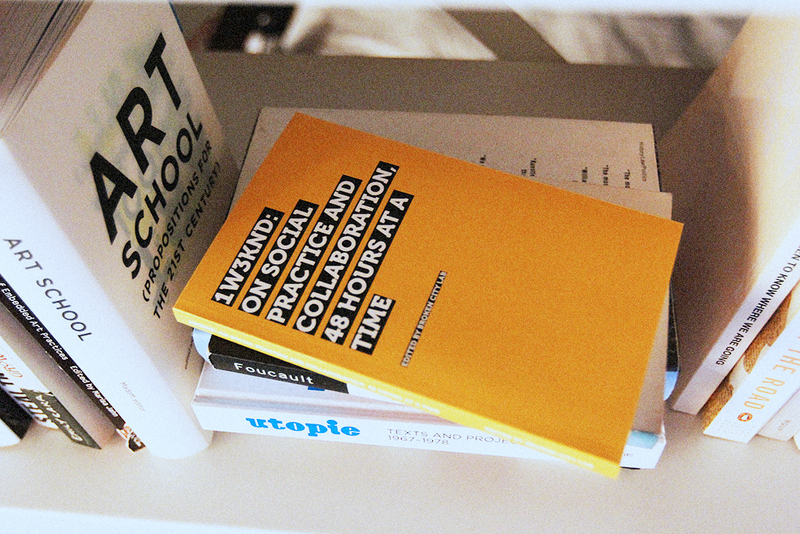 1W3KND: On Social Practice and Collaboration, 48 Hours at a Time – New Book Available Now! 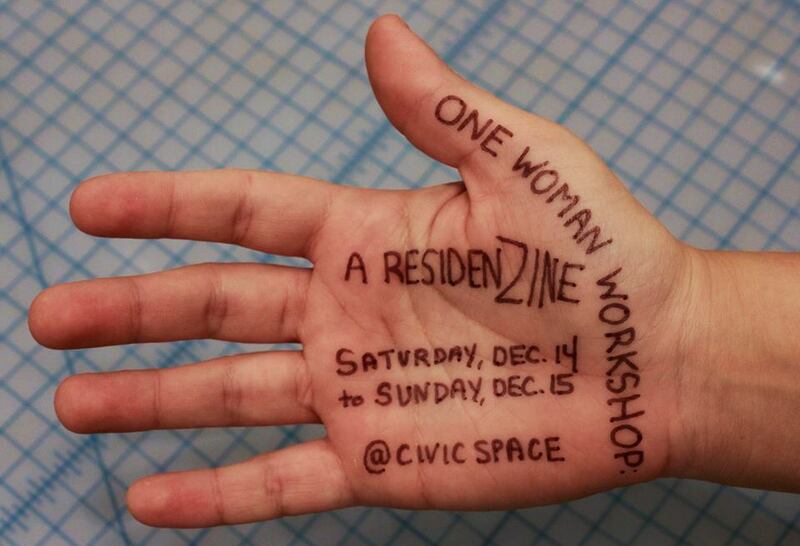 Late last year, we started hosting a series of weekend residencies at CIVIC Space. They were designed to bring together two people (and sometimes more) to write about socially-engaged practices. We wanted to provide a platform, or an excuse, or at least a quiet space to spend a bit of focused time writing. We wanted to do this because we were curious about the gap in writing from emerging practitioners, and that curiosity was driven as much out of our desire to read more from our peers as our realization that we have done very little writing on our own. So, we posted a call for submissions on our website under the title of 1W3KND. 1W3KND stood for One Weekend, Three Thousand Words, No Distractions. It would be a brief, yet focused two days, just long enough to pull away from everyday life, but not so long that the itch to overly-polish any of the writing would arise. It would ideally put people into a dialogue, maybe even with a stranger, to try to tease out new entry-points into likely familiar conversations and capture an urgency around itself. It would concentrate this activity in a specific place without necessarily insisting on a response to it. We compiled what they wrote into a book. It’s available now on Blurb for just $10. The residency as an experiment, as a site of production, or as simply a retreat, spurred writing that reflects a diversity of approaches towards articulating the concerns, ethics, aims, and ideals of socially-engaged practices. Largely written by emerging practitioners and minimally edited, this is not necessarily a cogent collection of essays — in fact, such an expectation would arguably be missing the point. This book captures an energy and urgency around a complicated set of ideas still unfolding in relation to a world rapidly shifting around them. To have the opportunity to collect the texts, at the early stages of so many of the contributors’ practices is a gift and hopefully a tool for further reflection and dialogue across geographies, politics, and practices. If we had more time at Civic Space, we’d probably do this again. Maybe someone else can pick up where we left off. Next in the Neighbourhood Spaces (NS) mini-doc series is an interview with artist-in-residence Ariana Jacob. She has been staying with us at CIVIC Space for the past month, and we’ve been lucky enough to catch occasional glimpses into the work she’s been doing. As a Neighbourhood Spaces artist-in-residence, Ariana has been based in Windsor’s Unemployed Help Centre and Tecumseh Mall. She has also been having conversations with the people she encounters on the streets, sidewalks and in transit as she travels from downtown Windsor to her community sites by bus. She has also made a series of great silkscreened posters that you may have seen on our blog or around town. Currently living in Portland, OR, Ariana makes artwork that uses conversation as medium and as a subjective research method. WORKING / NOT WORKING explores the basic realities of what people do for work these days, the place work has in their lives, and how contemporary work and economic realities are affecting how we understand ourselves. Drawing on Studs Terkel’s classic book, “Working” this project revisits his approach to the role work has in our lives considering how much more precarious work conditions have become since Stud’s 1970s. NS is a collaborative partnership between the Arts Council – Windsor & Region, Broken City Lab and The City of Windsor (“the Collaborative”). This program is made possible through the generous financial support from the Ontario Trillium Foundation. Here’s another great peek at one of the ongoing Neighbourhood Spaces projects happening right now in Windsor. I love seeing these projects starting to unfold — it’s only been a few months since we pulled together the roster and so exciting to see it starting already. Neighbourhood Spaces (NS) artist-in-residence Kenneth MacLeod (Windsor), will be developing and creating a new drop-in music resource and education centre at Sandwich Teen Action Group (STAG), a community-based charitable organization in the west end of Windsor, providing programs and support for at-risk youth. A former school, STAG offers an ideal location for the Centre, which will function as a music classroom, drop-in space and practice area. Throughout his 6 week residency, Kenneth will oversee the project and offer free music instruction and workshops to neighbourhood youth ages 13-20. After the residency, Kenneth aims to continue the centre, creating a permanent space for youth to develop and expand their musical skills and abilities in Windsor. He will also be at the Windsor Youth Centre (WYC), a drop-in Centre for homeless and at-risk youth ages 13-20 located in Wyandotte Town Centre. Every Wednesday he can be found jamming, teaching and learning with youth at the Centre. We have finally arrived to Calgary, Alberta after a delay in travel due to the insane flooding that has happened in the area. The city seems as though nothing even happened, but our minds will soon be changed. Upon arrival we were given a schedule filled with people to talk to and things to see for the next week. We started our day at the Water Centre. There’s such a huge amount of people that work that this place, it reminded me a lot of Chryslers back in Windsor. Tristan Surtrees, Watershed+ Residency’s lead artist, started our morning off by giving us a brief history of the Water Centre, its architecture, the types of people that work there, and the impact that this type of facility can have on a city like Calgary. Our first official meeting at the Water Centre was with Sylvia Trosch, who is the Lead for the Outreach at City of Calgary Water Resources. We had a great conversation with her about how it’s important for the citizens of Calgary to understand the watershed, especially in light of the recent flooding. Tristan and Sylvia survey a map of where the watershed extends to. The Bow Glacier is the starting point for Calgary’s water source and is our destination spot for Saturday. Sylvia gave us examples of booklets that she created for Calgarians to begin understanding better ways of conserving water and most importantly, understanding the water cycle. There’s also a kid friendly version. After our meeting with Sylvia, Tristan gave us a manual for Watershed+ that is full of valuable information on Calgary, its watershed, and how artists have been interacting with it. Here is a grid of images related to Calgary’s water infrastructure. One of the incredible things about Calgary’s rivers is how much they bend and turn. The results are some pretty incredible arial shots of the city, making it look like someone’s doodle/sketch pad. Information on how the residency is run. We are lucky enough to have been chosen to take part in the first ever version of this residency. Watershed+ brand image and logo graphics. The water bottle for the water resources in the Water Centre…WATER. Rachel Duckhouse is a fellow artist-in-residence who has been in Calgary for almost 6 months. Her residency has been extended until October, so her studio has been relocated from Ralph Klein Park to Spark. As we walk up to Rachel’s studio, she points out to us that the Spark Science Centre offers younger children their own studio space where they are encouraged to build, destroy, collaborate, and think through new ways of problem solving. All projects are open-ended with the intention that on the next cycle, a new group of kids will be able to come in and re-imagine something someone else has made. Real tools develop real skills. Dissembling stuffed animals only to re-sew them back with new parts. This is the workshop that Spark has given Rachel access to if she need to cut or build anything larger than her studio. They have a really amazing laser cutter set up in there. The second meeting of the day was with Twyla Hutchison, who is 1 in 2 planning engineers for the City of Calgary. She shared with us a lot of amazing information about the flood that occurred in June and how her research and emergency planning from all these years past was crucial in the evacuation of a lot of Calgarians. She leant this book to Rachel for her research. Flipping through all the data. Rachel shares with us the body of work she’s created during her residency. The body of work she created in Calgary is based off of the way water flows, whether it be in the rivers, through the sanitation plants, or even the homes that were affected by the flood. Rachel encapsulated her project aims for us while we toured her studio. She has been thinking through the many ways of representing the movement of water in rivers and around objects. This has been accomplished mostly with ink and paper, but also with plasticine and slices of transparent plastic. Awesome stuff. Tomorrow we have another day of exploration ahead of us. Stay tuned! Watershed+, hosted by the Utilities and Environment Protections department of the City of Calgary, is a unique art program which embeds artists and their individual processes within the Calgary watershed. We will be heading to Ralph Klein Park for Phase 1 of the project this Wednesday, August 7th, to visit the studio and surrounding wetlands, and to start thinking through our project happening next summer. We’ll be staying until August 15th, during which time we’ll be asking many questions, exploring the social and physical boundaries of the region, and using this information to inform our future project at Ralph Klein Park. Stay tuned for more info! Unfortunately, CIVIC SPACE WILL BE CLOSED UNTIL AUGUST 19th, but please register and stop by for the ACWR workshop, Modes of Documentary, happening here tomorrow, August 6th at 4pm and the Interactive Media & Video Installation workshops happening August 13th and 20th.